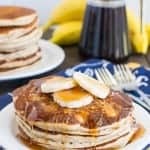 Looking for a way to use up those ripe bananas on your counter? Make a loaf of this Triple Chip Banana Bread and watch it disappear. Just make sure you grab a slice before it is all gone. Bananas are a hit or miss thing in our house. One week I can buy a bunch of bananas with the idea to bake something delicious, but then my family eats all of them as soon as they ripen. Don’t they know that those bananas were supposed to become Double Chocolate Banana Muffins? Or I get in banana-eating mood and eat all of the green ones before they can ripen. Yes, I am a crazy person who can only stand to eat fresh bananas when they are green. They have to crunch when I open the peel. My hubby laughs whenever he sees me eating these “banapples” because he loves a perfectly ripe banana. In fact, he prefers to eat his with the spots on them. To me, those are only good for baking when they hit that point. Then some weeks I buy the bananas, and they sit there forever. Ok, not forever, but until all of a sudden my kitchen becomes a fruit fly factory. One of these days I’m going to remember to try washing the bananas as soon as I come home and see if that really works. Good thing I love to make banana treats because if a whole bunch goes brown and spotty, we are going to be munching on Banana Nut Cinnamon Rolls and Banana Toffee Cake all week for breakfast. Both recipes are just perfect with a warm cup of coffee in the morning. Or in the afternoon if I’m being honest. This time when the bananas turned I decided it was time to ramp up this Sour Cream Banana Bread with some extra chip-loving. 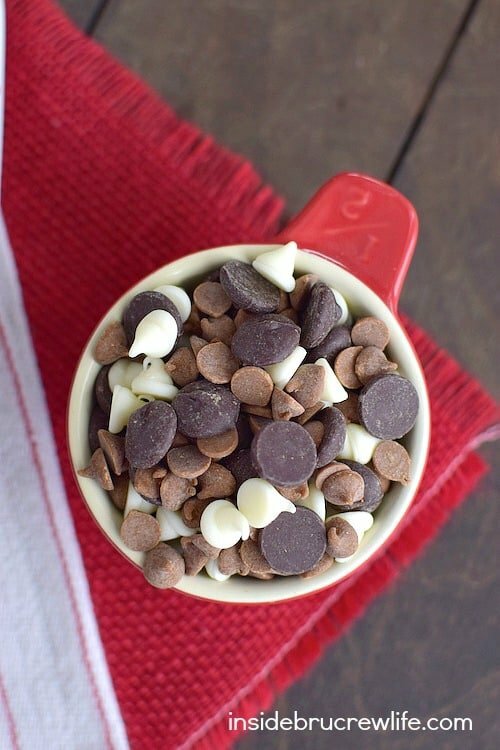 Extra chocolate chips always get rave reviews here. Now I actually wasn’t even going to photograph this bread because I only changed the recipe slightly. So, I sliced it up and let the kids go to town on it. I’m glad I jumped up and took pictures of it right away, because that loaf of bread didn’t last very long with 3 hungry kids munching on it. Ok, fine, I may have downed a few slices too. My daughter was right…this bread was totally awesome and had to be shared. Make a loaf and thank my daughter for her smart thinking. 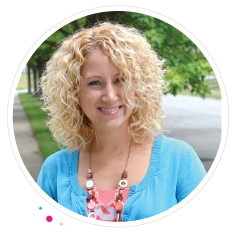 I am one of the breakfast contributors for Food Fanatic. 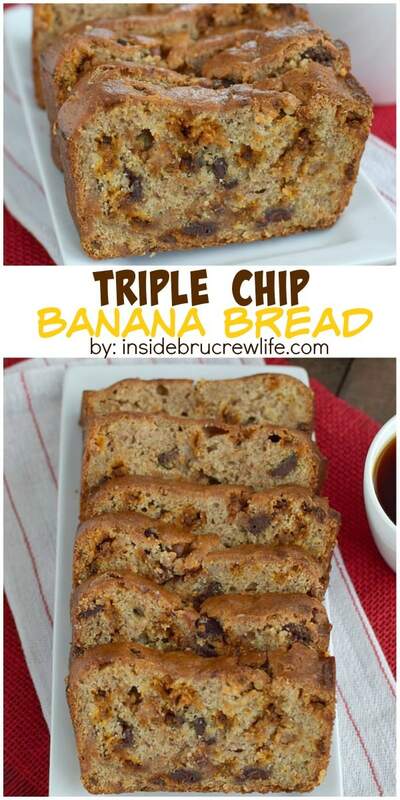 Head on over and print this Triple Chip Banana Bread recipe for later. You pretty much had me at “cinnamon chips.” Wow. 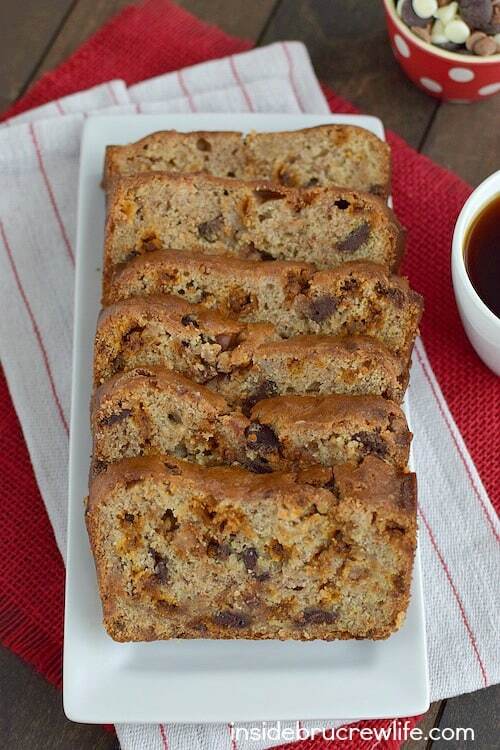 This banana bread looks amazing! But under ripe bananas, not so much. And those fruit flies drive me crazy!!! Thank you so much! Aren’t those cinnamon chips so good?!?!?! 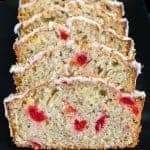 Desserty banana breads are my favorite! This looks so good I wish I had a slice for breakfast! 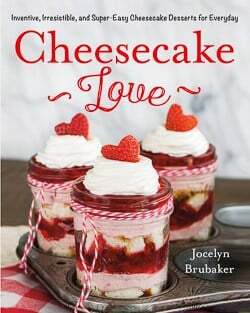 Well, those overripe bananas are calling me to make this! 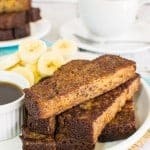 My husband loves banana bread and always is hoping for me to add a few chocolate chips to it. This would spoil him! I only eat green bananas too!! Good to know I am not the only one. My family thinks I am crazy. As for this bread. OMG I love how moist it is!!! LOL! My family thinks I’m a crazy banana eater too. I keep telling them there are others like me!!! I don’t like eating bananas because of the texture so I am super excited to try a green one now! I think I am going to love them too! I’m with you on the texture of a ripe banana…maybe that’s why I like the “crunch” of a slightly green one. Let me know how you like them! 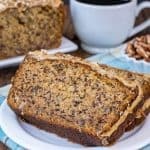 Your banana bread recipes are always so delicious looking. LOVE the triple chip idea!! 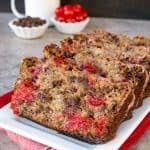 This bread looks amazing – adding a bunch of chocolate chips to banana bread is always a great idea! I’m the exact same way with fresh bananas though, they need to be underripe for me to eat them! I’d rather bake with them!! This bread looks delicious Jocelyn! I also like my bananas a little under ripe, though I don’t eat them green. They have to be just yellow without a single tiny speck of a brown spot. Thank goodness that even when bananas are a miss, they bake up the most amazing loaves! Case in point – triple the baking chips, triple the addictiveness. This loaf looks absolutely amazing Jocelyn! I love when I have ripe bananas to bake with!!! Ah, we both shared a banana bread today! It has to be one of my favorite breads ever but I find it terribly difficult to photograph. Your photos turned out great and those triple chips are calling out to me! I totally agree with you…breads are so hard to capture!!! I can’t wait to check out yours!!! Bananas never last in our house! I think each one of us likes them in just a different stage of ripeness. They never last long enough for banana bread. I have to buy rotten ones. This bread looks fantastic, though! Yup, same banana problems here!! Good idea to buy the already rotten ones specifically to bake with!!! 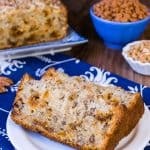 Wow, banana bread is an all time favorite! Glad I’m not alone in the way I eat bananas!!! I just love those cinnamon chips too, so there is always a bag in our cupboard for sneaking into baked goods! We eat so many bananas in our house. I have to hide them in order to get them to ripen enough for baking before they disappear. Always tricky! I should start hiding bananas too. Except I would totally forget about them and then have a complete fruit fly farm!!! Totally digging this bread, especially all of the delicious chips in the bread. LOVE! This looks awesome! I’m with you on the green bananas! That’s the only way I can eat them. I feel they’re sweeter. I usually save my old bananas for hummingbird cake. I need to try this! I’ve actually been getting into the habit of eating a banana almost every day! Shock, I know since I’ve hated them my whole life, but I am really trying to get more fruit into my diet. If bananas last long enough my house, this will be getting made soon! Definitely save a few bananas and eat banana bread instead 🙂 I can’t wait to hear what you think of it!!! Thank you for sharing banana bread. 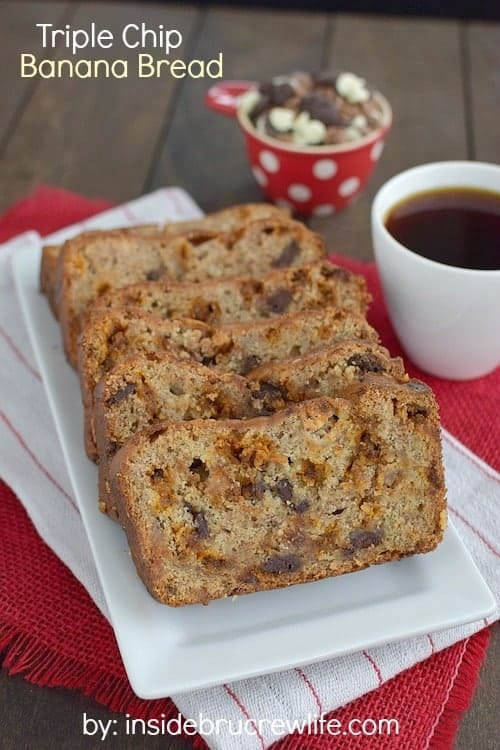 Nice twist on banana bread. We love the flavor of the three chips. 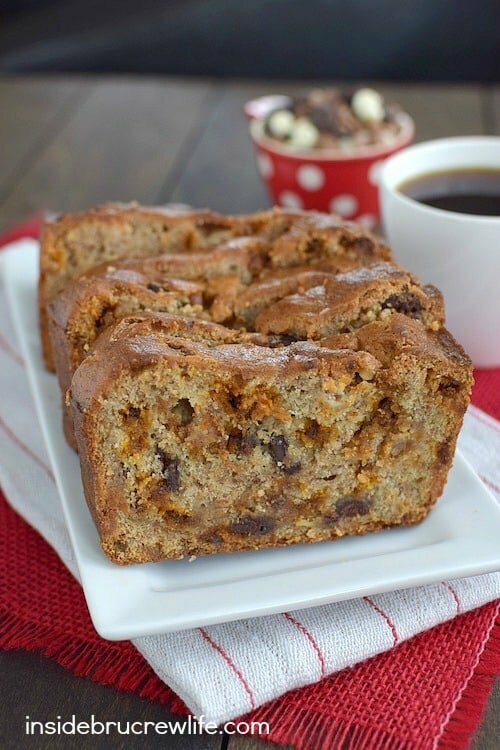 This banana bread looks amazing!